Charles, Prince of Wales, has been painting for most of his adult life. 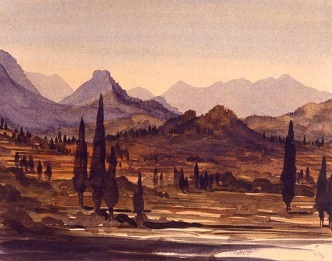 He creates watercolor landscapes, often of places he has visited throughout the world. Prince Charles' interest in painting began during the 1970s and 1980s when he was inspired by Robert Waddell, who had been his art teacher when he was a young man at Gordonstoun School in Scotland. He later discussed technique with and received tutoring from leading artists such as Edward Seago, John Ward, Bryan Organ and Derek Hill. Queen Victoria, The Duke of Edinburgh and The Duke of York were also artists. Prince Charles has exhibited his artwork a number of times over the years. Signed lithographs made from his paintings are sold, with any income generated going to The Prince’s Charities Foundation. The original paintings are not sold. In 1991 he published a book of his artwork titled H.R.H. The Prince of Wales: Watercolours. Two of Prince Charles' paintings will be on display later this month at the Strathpeffer Pavilion Annual Art Fair. For more information about artwork by Prince Charles, visit The Prince of Wales website. You may also want to check out Belgravia Gallery, where watercolors by The Prince are available for purchase. They also have a nice video in which they discuss his artwork and that of other members of the Royal Family.